Hi everyone! I hope you're all well. It's been a long time since I've posted on here: exams and school took over my life! But I'm back now and hoping to continue with my blogging journey. 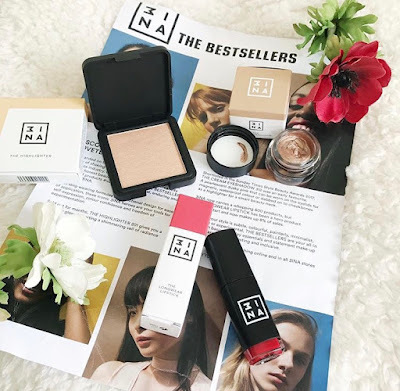 In this week's post I'm going to introduce you to my new favourite makeup brand (and hopefullly yours soon, too): 3ina. I was super excited when I was contacted by the team at 3ina who were offering me the chance to try their best selling products, and after seeing all their gorgeous products on Instagram and on their website, I had to say yes! 3ina is a new, super trendy, super affordable and cruelty-free makeup brand which has all the makeup products you could ask for. Their best-selling products where voted for by the public and are available online and in 3ina stores this summer! So, let's have a look at some of these well-loved, cult products. I received 3 amazing products; the Cream Eyeshadow in shade 313, the Highlighter in shade 201, and the Longwear Lipstick in shade 500. I am a huge fan of cream eyeshadows, as I find them so much quicker and easier to apply than powder eyeshadows, and I find them to be much more pigmented than any other eyeshadows, many of which barley show up on my eyelid, so naturally I was very excited to try this! I can say it is now my favourite cream eyeshadow at the moment, as it is amazingly pigmented - a little goes a very long way! - thanks to its soft and moussy formula, and the colour is a stunninf bronzey-gold with a slight pink shimmer (it even sounds amazing!). It dries quickly and feels lovely and light on the lids and looks gorgeous, with a slight metallic finish. As you can probably tell, this is my favourite product out of the three and I'm sure it's going to be an everyday must-have for me! It retails at £8.95 is cruelty and paraben free, and comes in 18 gorgeous colours. Next up, one of my favourite steps of my makeup routine... highlighter! This iconic highlighter is often sold out, which is a testimony to how stunning and popular it is! It's a gorgeous bronzey toned highlighter, making it perfect for the summer, and creates a beautiful, natural glow to the skin and is definitely not too harsh, unlike some highlighters out there! It retails at £10.95 and is cruelty free, paraben free and vegan! Last but not least is 3ina's bestselling Longwear Lipstick. I am obsessed with lipsticks, so was so excited to receive this! Living up to what it says on the package, it lasts well and is extremely pigmented, applying like a watery lacquer, but then setting with an almost-matte finish and looks kind of like a stain on the lips, meaning it stays on well and feels super light on the lips, as if you aren't even wearing anything! The colour is a bright, postbox red and I think it would look good with every skin tone, and is the perfect red lipstick for all occasions. It retails for £7.95, is cruelty and paraben free and comes in 14 colours (yes, I need them all). To finish off this post, I have included some swatches of the products above. (L-R: Longwear Lipstick shade 500, Cream eyeshadow shade 313, Highlighter shade 201). Thank you to the lovely 3ina team for sending me out these amazing products. I will definitely be picking up some more! Leave me a comment below if you've tried any 3ina products and let me know what you thought! I've not heard of this make up brand but the products look lovely! Great post. I have never heard of this brand but it looks amazing!